The photo school term has begun and all the new students are now roaming New York with their cameras. These are the halcyon days of image discovery. But it is here that we would all do well to remember The Hippocratic Oath of a Photographer as written by M.F. Agha for U.S. Camera way back in 1937 [from the vertical files in the ICP library]. Not only is this an absolutely brilliant poem/rant, it is also an indispensable piece of advice for any camera happy person who is seeking to avoid the dreaded photographic cliché. These are the words to remember before you shove that expensive camera of yours into the unsuspecting face of a homeless person or a tearful child. Art Director M.F. Agha could merely have been having a bad day but then again if anybody would be familiar with the nauseating dangers of image cliché then it would be him (impressive career here: http://www.adcglobal.org/archive/hof/1972/?id=293 ). The most important thing for all of us to remember is . . .Think before you shoot! At least try to avoid the cliché especially in these days of total image saturation, and even though that may be impossible, at least be aware of it. Don’t forget sign up for an email subscription to our blog via the link at the top of the left side bar (email subscription). This entry was posted in Unpacking the collection, Vertical files and tagged M.F. 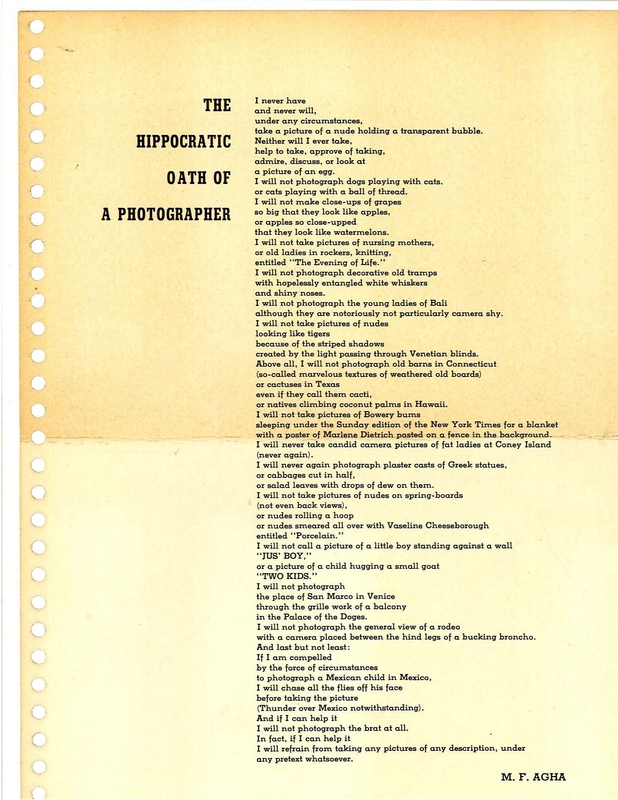 Agha, Martin Parr, The Hippocratic Oath of a Photographer, U.S. Camera. Bookmark the permalink. Hey very cool blog!! Guy .. Excellent .. Wonderful .. I will bookmark your web site and take the feeds alsoâ€¦I’m happy to seek out so many useful information right here in the post, we want develop more strategies on this regard, thank you for sharing. I’ve been studying buildings for over 20 years. It is safe to say that this building is the most marvelous one on the planet. Visit it once and you will agree with me! One wonders what list Dr. Agha would compile after a few evenings of flickr – let’s not even consider extended exposure to such a behemoth. One can only wonder. I had seen this several years ago & could never find it when I needed it: many thanks. Clearly you did not understand the ironic conclusion to this piece. It says, don’t become a photo snob. Pingback: >Re: PHOTO » Blog Archive » Which Clichés Have I Made Today? It’s funny to think that photographic clichés may have been around as long as there have been photographers! I am a photog professor and love this both as list and as image. Can I have a high resolution copy so that I may print it for my department notice board? Hi, I think we can. Let me confer with my colleague who scanned. THANKS for looking! Direct your students to our whole blog, OK? I have indeed taken a photograph of an old barn in Connecticut, but I will refrain from posting the Flickr link here. Ive just lately began a blog, the information you present on this website has helpful to me tremendously. Thank you for all your time & work. I just want to say I’m beginner to blogs and honestly enjoyed you’re web-site. More than likely I’m want to bookmark your site . You actually have impressive well written articles. Thanks for sharing your blog. I simply want to mention I’m very new to weblog and certainly liked this web-site. Very likely I’m likely to bookmark your blog . You really have wonderful well written articles. Cheers for sharing your blog. We stumbled over here by a different page and thought I might check things out. I like what I see so i am just following you. Look forward to looking into your web page repeatedly.